You say Easter, they say Ishtar, I say Eostre. 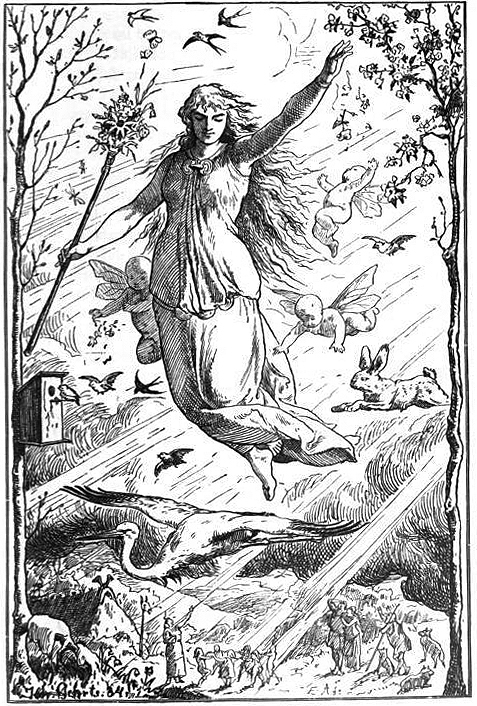 Ēostre or Ostara, the Germanic goddess of Spring. By Johannes Gehrts (1884). Ah, spring! The smell of flowers, copulating rabbits, and anti-theist propaganda. I had originally planned on discussing the history of Easter at length in order to debunk the dubious claim it was originally in celebration for the Mesopotamian goddess Ishtar, however I discovered that other bloggers have already done an excellent job doing so. Long story short, Ishtar has nothing to do with Easter. Rather, historians believe that the Easter we celebrate today took most of its aspects from the Germanic spring festival commemorating the pagan goddess Ēostre – whose fertility symbols included rabbits and eggs. The end of winter was a time for celebrating the resurrection of spring and good harvest for many cultures, and therefore it shouldn’t come as a surprise to learn that Christians in Europe chose to adopt already attractive pagan elements into their celebration of the resurrection of Jesus – a move not unusual in the history of Christianity. But maybe I’m wrong. Perhaps the symbols of Easter do go back to the early days of Christianity. Baby chicks coming out of eggs could represent Christ emerging from his tomb; the rabbit represents Jeshua Cottontail – the animal’s Messiah; we eat chocolate because it’s brown and so was the cross. See? It is possible for Easter to remain purely Orthodox. For further information on the history of Easter check out www.historyofeaster.info. Now that that’s settled, I thought I’d take this occasion to discuss the historicity of Jesus’ resurrection, which I think most will find quite eye-opening. Since this post is a tad long and exhaustive scrolling can lead to carpal tunnel, feel free to jump to its following segments. What Did the First Disciples Believe? 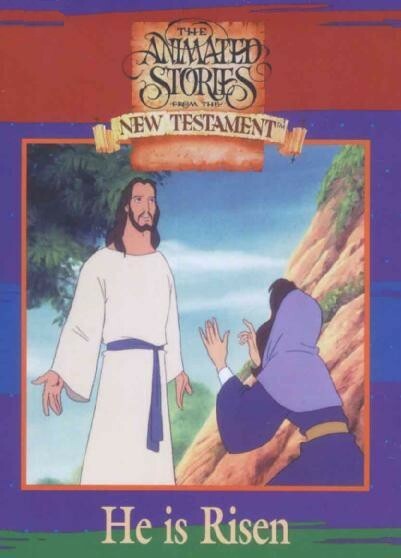 When I was a young tike my mom would occasionally put on for me the imperative cartoon for cool Catholics growing up in the 90s: Animated Stories from the New Testament on VHS. All I really recall learning from these tapes was that Jesus was an important man who was white, soft spoken, could perform magic tricks, and had women begging at feet. I’m happy to report that my understanding of the historical Jesus has grown with my height since then, eventually forcing me to accept the fact that these stories about him aren’t as simplistic and straightforward as many believers continue to claim. It wasn’t long ago I rediscovered the episodes of the cartoon online, finding it quite interesting how the writers attempted to weave together the gospels to construct a single, consistent account of Jesus’ life, death, and resurrection. Granted, if you were to quickly read through the gospels one by one, your memory would probably do the exact same thing, like a puzzle: remembering the story of Jesus as a single unit after having pieced together the different accounts – all while having payed little attention to pieces which turned out to be doublets or don’t fit together smoothly.